Ah, dude. TMI. But a valid question nontheless. Taking blood pressure without gear is more subjective, more error-prone. The ATLS guidelines used to argue that you can guesstimate blood pressure, depending on where you can feel a pulse. Radial pulse: SBP > 80. There are a couple of studies that disagree on the details. We will focus on the most recent one, found here. They took various hypotensive patients, placed arterial lines (the gold standard for blood pressure measurement) and then had folks try to feel pulses. They found that the pulses all disappeared in the same order: first radial, then femoral, then carotid. (I’ll point out that the shorthand for Group 4 is: dead. And I do hope CPR was invoked soon after). 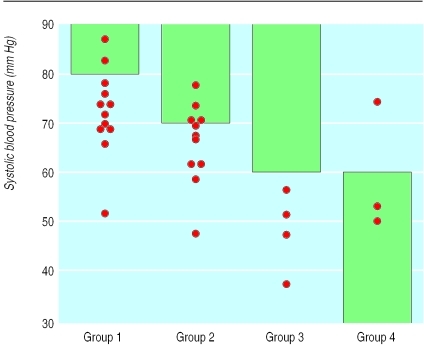 The green bars are the expected SBPs from ATLS; the red dots are the SBPs as measured. You can see that there is quite a bit of scatter, and no hard and fast rules. However, in Group 1 they more-or-less cluster around the low 70s; Group 2 averages 66 (I can’t really call that a cluster. Well, not in the scientific sense). Group 3 and 4 show the actual data quite a bit lower than predicted from ATLS. The above is important. This article indicates that there is a floor, below which your patient will simply undergo circulatory collapse (this is the irreversible shock Ivy Mike refers to late in this post, and it means your patient is dying right now). There is some wiggle room, as certain diagnoses confer a slightly higher SBP at which your patient just flat-out dies, but once you crack a SBP of 50, your patient has very big problems. If they are not in a full-fledged ICU, they are not likely to live. That threshold, on the graph above, shows 1 person that still has a femoral pulse, and about 50% of those with only a carotid pulse, fall into the Dying Right Now category. If you are truly out in the wild, with no resources, you would triage these folks as black–not recoverable–and move on, despite how hard that decision might be. Assignment #1: practice taking carotid, femoral, and radial pulses. And time yourself–see how quickly you can find and feel the pulse. Ask yourself–is this a strong, bounding pulse that about knocks my fingers off the neck? Or am I having to imagine a little bit to feel it? Find one of the pulses from A&P lesson 2.11, Assignment #1, that is a weak pulse–the popliteal is frequently weak–and get in your head, and in your fingers, what weak vs strong feels like. Assignment #2: Make sure there are no competing interests, prior to reviewing “anatomy lessons.” Geez. Fixed the link, thanks! Double bonus points. Airway, breathing circulation and disability in one swift move. I triage based not on the injury but on the reponse or compensation or tolerence to it if you will. Disability (AVPU and ability to comunicate well track visually and pin point pupils) – stable or unstable. The radial pulse being present along with LOC gives a measure of reassurance of at a mimimim they are currently perfusing brain, kidneys and other vital organs. I triage black red or green as triage is so inherently inacurate that yellow seems quite useless. Sounds similar to what I call the “eyeball test” in the ICU. Before you flat out panic, if the person isn’t well known to you, find out if they’re aggressive runners or swimmers. This shifts the above graphs WAY down. Guy walked out thinking his gear was broke. Lady involved was mid 50’s swam 2-3 miles a day and ran in the warm months. NORM BP for her was 50/30 with a pulse of 40 if she was excited. Helps to know your patient. Like the 70 yr old guy in a car accident with a BP of 100/70. At my age this is great., at HIS age he was in shock, heading to decompensated shock.